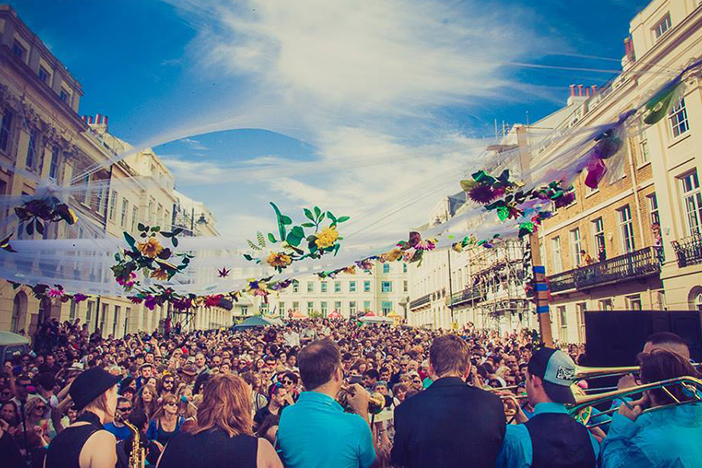 Just as Brighton Festival comes to a close, up jumps Kemptown Carnival ready to keep the party going. Twenty-five thousand visitors are expected this Saturday for what is the largest free street arts event in the South East. If you’re new to the city, this is a Brighton institution you need to know about. If you’re a regular, you’re still in for a treat as this year’s carnival is bigger than ever before. The carnival opens earlier than usual, starting at 10am with the Parade of Flowers followed by a procession of over 800 performers. The carnival footprint has also expanded to accommodate nine live music stages. Normanton Street, Bloom and The Mountain Firework Company are among the 50+ acts playing throughout the day – alongside Carnival Collective, Lakuta, Dub Organiser, Harry’s Tricks, Swing Ninjas, Fat 45, King Lagoon’s Flying Swordfish Dance Band, Paperboy and Flash Mob Jazz. Basically, there are too many to mention. While the live music tends to wind down in the late afternoon, there’s more in store on the seafront for those keen to keep the carnival vibe going. This year the organisers have put on three separate afterparties at The Tempest, The Fortune of War and the Riki Tik Beach Bar. The likes of Prince Fatty and The English Disco Lovers will be at the decks. Though the carnival first started in the 90s, it has been given a new lease of life in recent years thanks to director Matt Cook, who also runs the Lantern Fayre on The Level. When he’s not running brilliant homegrown community events, you might just find him sporting a jester’s hat at the front of one of the many samba bands taking part in the procession. However, as you can imagine, running an event on this scale isn’t cheap. With core costs exceeding £60k, the carnival only happens with the help of ongoing contributions from the public. 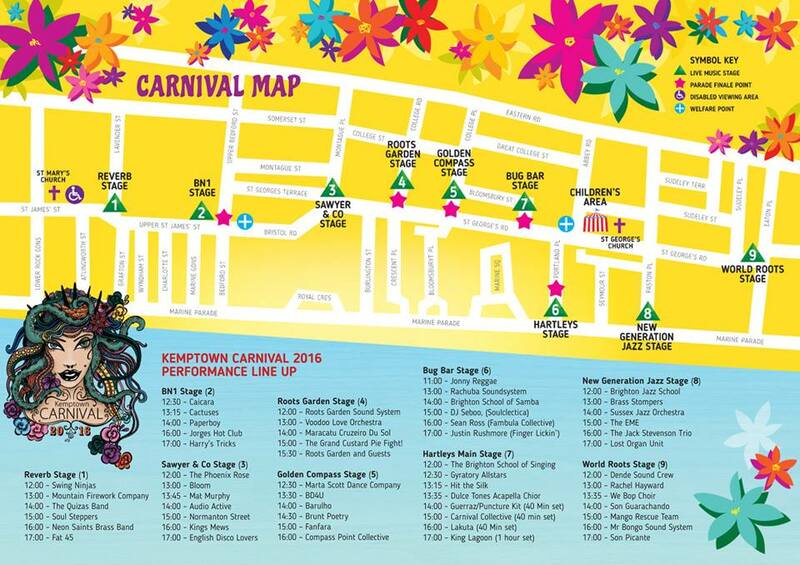 If you’re planning to head to Kemptown on Saturday, make sure you stop by the carnival’s crowdfunder page first. A tenner will bag you a digital album of some of Brighton’s best bands, many of whom you’re likely to hear on the day.